The Sixers snag their first road win of the season against the Pacers as Joel Embiid puts up 20 points and 10 rebounds and Ben Simmons adds 16 points and 10 rebounds. 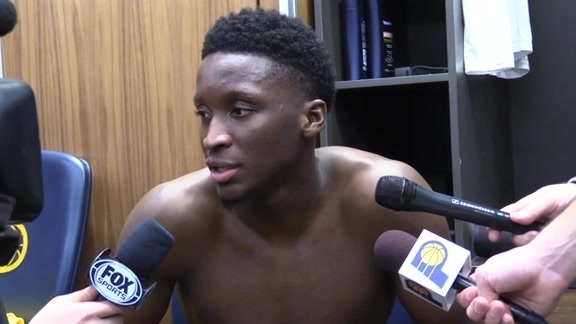 Nov. 7, 2018 - Victor Oladipo, Thaddeus Young, and Tyreke Evans speak to the media following Indiana's 100-94 loss to the Philadelphia 76ers at Bankers Life Fieldhouse. Nov. 7, 2018 - Pacers guard Victor Oladipo scored a season-high 36 points to go along with six rebounds and seven assists in Indiana's 100-94 loss to Philadelphia at Bankers Life Fieldhouse. 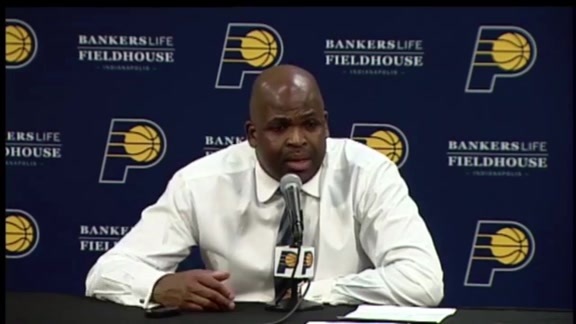 Nov. 7, 2018 - Pacers head coach Nate McMillan speaks with the media following Indiana's 100-94 loss to the Philadelphia 76ers at Bankers Life Fieldhouse. The Pacers trailed by just seven entering the final quarter at Bankers Life Fieldhouse, but a 14-4 Philadelphia run to start the fourth proved to be Indiana's undoing on Wednesday as the Pacers fell 100-94. "I think we just need to loosen up a little bit and go back to playing free basketball," said Victor Oladipo. "We still defended at a high level. We have to find a way to get our groove back; but we’ll find a way." Despite trailing by as much as 17 points in the fourth quarter, Indiana (7-5) had a final rally left in it with just over five minutes remaining in the game. It started with a Bojan Bogdanovic 3-pointer, then was followed by a three from Oladipo and a layup from Domantas Sabonis to bring the deficit to single digits. Moments later, after the 76ers (7-5) extended their lead, Bogdanovic struck again from deep, canning a three to bring the score to a 98-90 lead with two minutes left. Oladipo had a look from the wing, a shot he's nailed in recent weeks, but the ball spun around the cup and out with just over a minute remaining, essentially ending Indiana's comeback bid on the night. The loss overshadowed a stellar offensive night from Oladipo, who finished with a season-best 36 points, 24 of which came in the first half. But despite Oladipo's offensive eruption, the Pacers struggled as the team, connecting on only 8-of-31 shots from long range. "You’ve got to make some shots. If you’re not making shots, then they’re not going to double team," said Pacers head coach Nate McMillan after the game. "If you can’t create penetration and break the defense down, they don’t have to leave the perimeter. So, we’ve got to make some shots." The Sixers were led by the bruising pair of forwards Joel Embiid and Dario Saric, who combined for 38 points. It was a tough night on offense for the Pacers, who failed to break 100 points for the second game in a row. The Blue & Gold shot 38.7 percent from the field, and only had three players reach double-figures for scoring. Indiana began the night unable to get its offense started, quickly falling behind 13-2 as the 76ers built an early advantage. With the Pacers looking for a spark, their leading scorer gave them one, as Oladipo racked up 10 of Indiana's first 12 points to bring the deficit back down to single digits. Indiana closed the first quarter on a positive note as Tyreke Evans and Sabonis each scored in the paint, slicing the score to a six-point Philly lead. To start the second quarter, the 76ers scored two straight buckets to jump ahead by 10. With the reserves in the game, Indiana's offense started to flow, embarking on a 13-0 run to vault the Pacers into the lead. The Sixers responded by scoring seven unanswered to retake the lead, but Oladipo again had an answer, getting two straight buckets, including a fastbreak dunk to ignite the home crowd. Trailing by two and with the clock winding down, Oladipo went to work on Embiid, getting a floater to fall over the towering center to tie the game at 50 apiece as the teams entered the halftime locker room. With the third quarter underway, the 76ers starting to catch fire from long range, making two quick shots from behind the arc to move ahead. 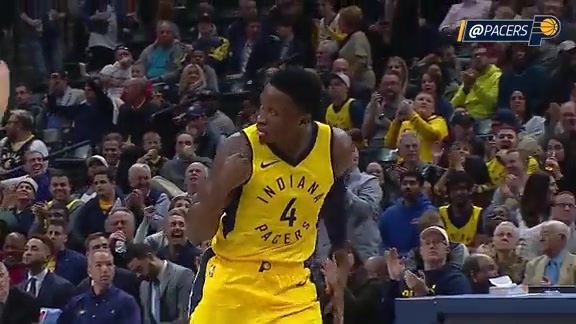 Indiana briefly took the lead when Oladipo connected on a three of his own to make it a 66-65 advantage with 3:44 left in the quarter, but the 76ers went on a run from there, opening up a 78-72 lead over the Pacers entering the fourth. 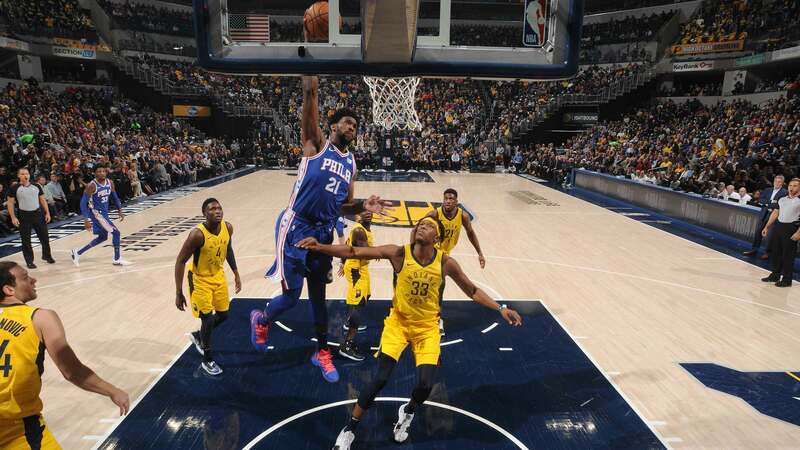 To begin the final quarter of play, Indiana found itself in danger early as baskets from Robert Covington and Embiid quickly put the Pacers behind 84-73 with 10:29 left in the game. But danger didn't stop there. Philly continued its attack, expanding their lead when Saric and rookie Landry Shamet hit back-to-back 3-pointers. The Pacers were unable to complete their comeback bid from there, dropping their second-straight home game. Sixers forward Ben Simmons nearly notched a triple-double with 16 points, 10 rebounds, and eight assists. Domantas Sabonis had a strong game off the bench, scoring 16 points and grabbing 11 rebounds in 32 minutes. Indiana shot just 39.4 percent from the field, its lowest percentage at home this season and second-lowest overall. Victor Oladipo's 36-point performance was his highest scoring night of the year. He finished the night 14-of-30 from the field, to go along with six rebounds and seven assists. The 76ers lead the all-time series 98-78, including a 45-43 edge when playing in Indiana. The Pacers were outscored in every quarter except for the second. The 76ers earned their first road win of the season after an 0-5 start away from Philadelphia.